This movie was awesome! I laughed, cringed, and cried. 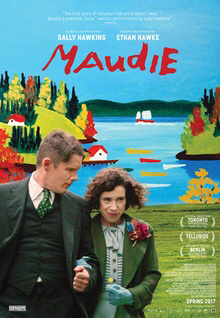 Ethan Hawke (Everett Lewis) and Sally Hawkins (Maud Lewis) play the lead roles. Sally Hawkins obviously put a lot of heart and soul into the role. Ethan, I haven’t watch him in many roles, Dead Poets Society probably was the last one I saw. I’m totally in his fan club now! The Cinematography was beautiful. Shot in NFLD but resembled Digby and Marshalltown N.S. I was impressed.